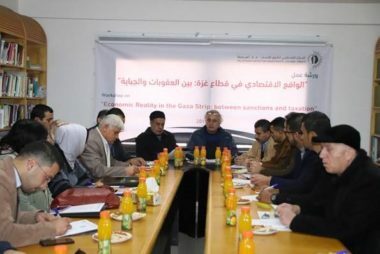 The workshop that was attended by sociologists, economists and media discussed the financial policies in the Gaza Strip and their impact on the economic and social rights. Raji Sourani, Director of PCHR, opened the workshop by reviewing the economic reality in the Gaza Strip and deteriorating living conditions of the Gaza Strip residents resulting from the general political situation, the sanctions and taxation. Sourani emphasized that the financial and economic institutions in the Gaza Strip shall not impose taxes on civilians without any legal reference. He added that the Palestinian Authority (PA)’s institutions shall not prejudice the salaries of public servants without any legal basis. In his intervention on the banking system in light of the economic reality in the Gaza Strip, Dr. Saif al-Deen Yousif ‘Odah, Head of Monitory Policy and Financial Markets Department in the Palestinian Monitory Authority, reviewed the financial policies in the Gaza Strip, including the expansion of the banking system in 2010, and giving credit facilitations. He indicated that the economic, security and political developments have directly affected the economic growth and activity, particularly in light of the deductions on the public servants’ salaries and forcing thousands of them into early retirement between 2017 and 2018. He added that these measures have significantly impacted the living, human and economic conditions in the Gaza Strip. In his presentation, ‘Aref Abu Jarad, Head of PA’s Public Servants Union, said that the living conditions of the public servants has deteriorated due to the government’s policies and measures taken against them since 2017, starting from the deducting the public servants’ salaries in the Gaza Strip and forcing thousands into early retirement without referring to any laws that regulate civil and military servants’ rights. Abu Jarad added that the policy of cutting salaries has started since 2007 following the Palestinian Government’s decisions at the time to cut the salaries of hundreds of employees upon malicious reports and later withholding the salary allowances of all forms. Khalil Shaheen, Head of PCHR’s Economic and Social Rights Unit, said that closing the national reconciliation doors by the end of 2018 resulted in imposing further economic sanctions on the Gaza Strip; forcing thousands of PA servants into early retirement; continuing the deductions of the servants’ salaries in the Gaza Strip; and minimizing funds allocated to the health service. All of that coincided with Hamas Movement’s imposing more and more fees and customs on imports under the pretext of protecting the national products. Shaheen added that the high rates of unemployment which recorded 53.9% among manpower while this rate was recorded the worst among the young graduates, amounting to 69% for males and 80% for females. He elaborated that poverty rate increased among the Gaza families to 54%, including 36% living in extreme poverty, while the food insecurity levels reached 68.5%. ‘Awni al-Basha, Assistant Deputy Minister of Finance in the Gaza Strip, addressed the Government’s financial performance and its impact on the economic situation in the Gaza Strip. He attributed the reasons of the deteriorating social and economic conditions in the Gaza Strip to the Israeli closure imposed on the Gaza Strip and sanctions imposed by the PA. He added that the Gaza Strip revenues decreased to 50 million shekels in 2018 comparing with 2017 when the revenues were 80 million shekels. Al-Basha said that the Ministry of Finance provides facilitations to many sectors, including canceling the fees for the revenue stamps upon the request of the Palestinian Businessmen Association in the Gaza Strip. Mohammed Abu Jayyab, economist, pointed out in his intervention titled as “A Review on the Financial Performance in the Gaza Strip” to the failure of developing financial and economic policies in 3 phases: the phase following the 2008-2009 offensive, which is the economic recovery that depended on the leap in the construction sector while the financial performance at the time based on the tunnel trade; the second phase was 2009-2013 when the disbursement and expenditure levels decreased and the productive policies turned into the product-trading policy; and the third phase was from 2014 to 2017 which witnessed closure of tunnels, accumulation of crises, dwindling international support, fund-drying up, and acute decrease in cash flows into the Gaza Strip. Calling upon the financial governmental institutions to allow access to information relevant to statistics in the economic and financial fields.